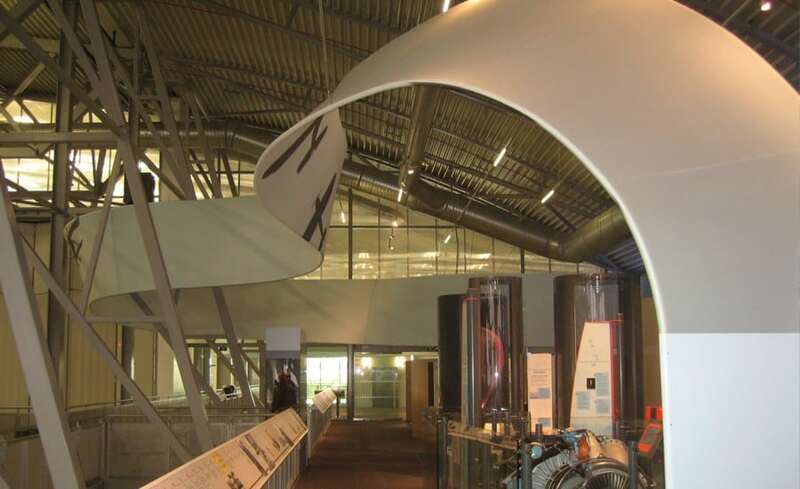 As part of the new 25 million AirSpace development project, Architen Landrell won the contract to install an impressive 225 metre long fabric ribbon structure at the Imperial War Museum in Duxford. 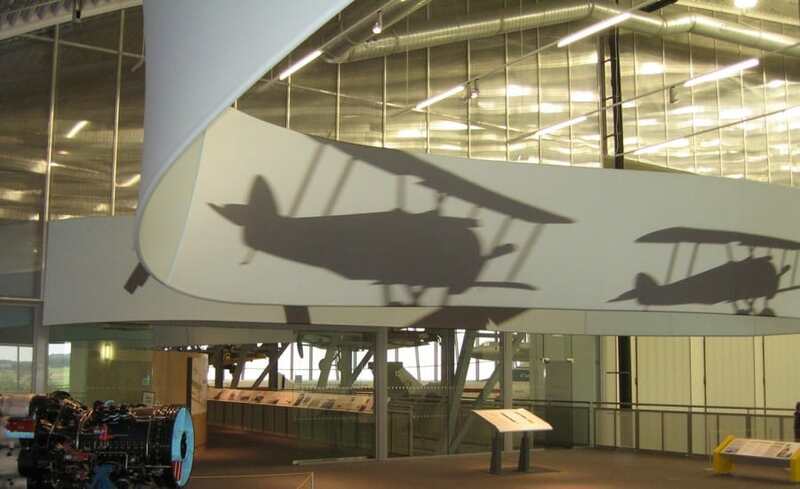 Known as The Flight Path, this structure not only provides a dramatic visual cue to lead visitors through the exhibition, but is used in a number of ways to enhance the displays themselves. 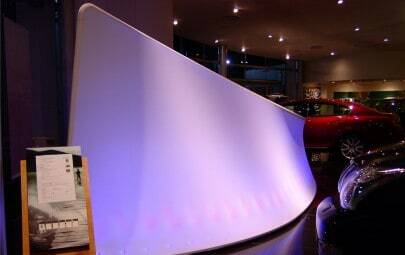 Presenting large bold printed graphics, its surface forms a projection screen for audio visual presentations and a back drop for effects lighting, which helps to identify distinct areas of the exhibition, giving different areas a sense of enclosure and a surface on which to present various materials or aircraft components. 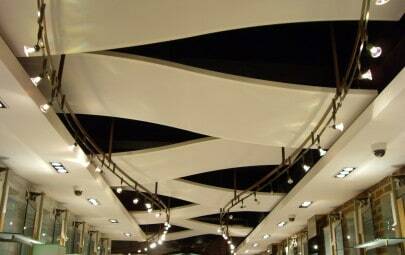 Created from a stretch material made from Lycra, and then dyed and printed with the aeroplane silhouettes, the fabric was chosen to be as malleable and flexible as possible. Socks of the fabric were made and then stretched over a steel frame to create a perfectly smooth and continuous ribbon. 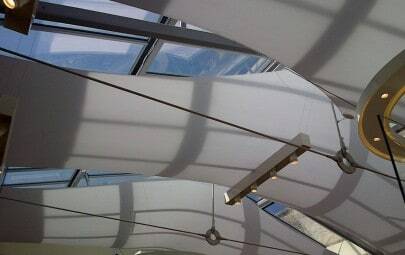 The Flight Path was conceived as a 1.8 metre wide undulating, twisting ribbon that passes in three-dimensional form down the length of the first floor gallery. Starting at the main entrance on the ground floor, the structure rises up the stairway to the main exhibition space, and performs a number of aerobatic manoeuvres as it flows throughout the hanger. Once an RAF fighter station, Duxford is now part of the Imperial war Museum and is home to a large collection of aviation and land warfare exhibits, including important historic aircraft from all over the world. 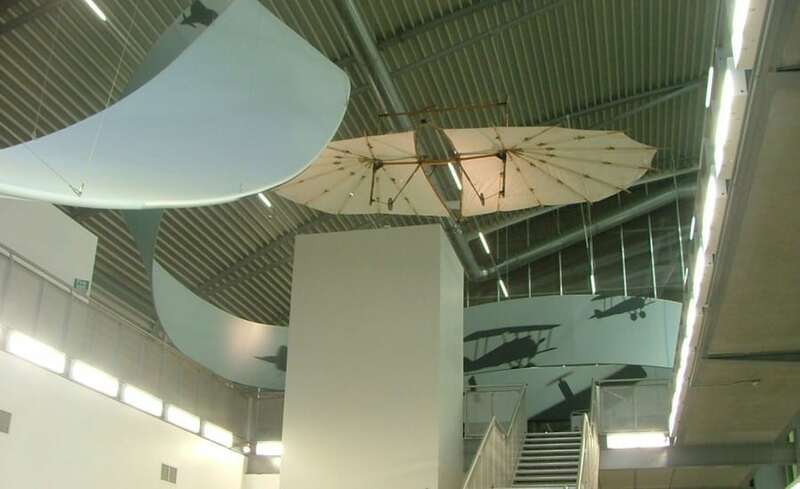 Sited within seven large buildings, the museum houses many exhibition themes including the Battle of Britain, Aircraft Conservation, and Land Warfare from 1914.